Toast tortillas until lightly browned. Cut into 1- inch pieces. In a large skillet, cook beef until no longer pink; drain. 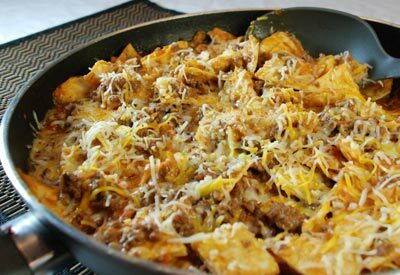 Add soup, salsa, water, tortillas and 1/2 cup of cheese. Bring to a boil. Cover and cook over low heat for 5 minutes or until hot. Top with remaining cheese.